Linqiong, today called Qionglai, is a town about 50 miles southwest of Chengdu in Sichuan province. It is here that the famous poet Sima Xiangru is said to have seduced Zhuo Wenjun by playing the qin. Linqiong Yin occurs only in Xilutang Qintong, which makes it a prelude to #155 Feng Qiu Huang, and with no separate preface. Its introduction is here likewise combined with that melody. None: see Feng Qiu Huang. 30758.46 臨邛 mentions the connection between Linqiong and Sima Xiangru. From standard tuning lower the third and sixth strings (details). 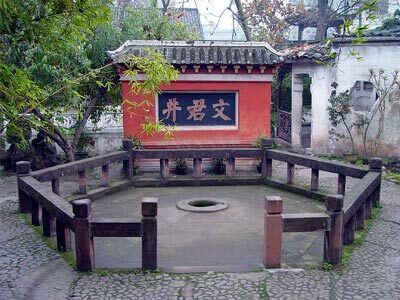 The Wenjun Well ahown above is said to date from the Western Han dynasty, and local tourist brochures say that Sima Xiangru and Zhuo Wenjun used its water to make wine for their wineshop. It is part of a "Wenjun Garden....a key historical site under provincial protection....built in the style of the Suzhou and Hangzhou gardens....the place where Sima Xiangru and Zhuo Wenjun played guqin". The garden is intended to evoke the home of Wenjun's wealthy father, 卓王孫 Zhuo Wangsun (see the Shiji story), but there is no actual historical evidence connecting this place with events of such great antiquity. In October 2006 the Qionglai and Chengdu governments organized a "Cultural Festival for the Guqin and Zhuo Wenjun", at which I performed. The festival opened with a gala event in the Qionglai town square involving famous senior Chengdu qin master Wang Huade playing along with a recording of Meihua Sannong, accompanied by about 30 young players. This gala event also included pop songs about Wenjun and Sima Xiangru, minority song and dance, and a choral arrangement of a modern version of Feng Qiu Huang (which uses the lyrics of Wenjun Cao).